I found this article quite interesting. In the past I smoked a cigar with a glass of scotch because is a standard concept. Now that I’m in to craft beer I know that I can expand my taste of pairing a good cigar with a good beer. Since Father’s Day weekend is coming soon this will be a perfect time for a new experience. Hope you enjoy it too. You don’t need to be a cigar fanatic to enjoy a fine cigar, just as you needn’t be a huge craft beer enthusiast to enjoy one of the thousands available. Not unlike craft beer, cigars have lost some of their exclusive cachet—gone are the days where you’d exclusively see a stogie clutched in the teeth of the rich and famous. While cigars have long been associated with whiskey, they’re just as well matched with craft beer. This new pairing phenomenon boasts endless combinations and is already spawning theories, opinions and personal tastes. Beer-cigar pairing is a subjective experience. What one fancies, another despises; what some embrace, others refuse. I can’t pretend to establish firm rules, boundaries or proclamations for combining cigars with craft beer. Instead, here are some loose guidelines, tips and insights from a longtime cigar enthusiast and craft beer aficionado. The foremost factors in the enjoyment of a cigar are tobacco, wrapper and size (vitola). Cigars are usually four and a half to seven inches long. The width will affect smoke flavor. Smoke from skinnier cigars is more intense, while smoke from wider rolls is more flavorful. The cigar wrapper holds the majority of the cigar’s flavor, and it’s common to match the color of the wrapper with the color of the beer. A dark, rich maduro would pair well with a stout. A claro should pair well with a wheat ale. Cigars are widely reviewed in thirds, like a story with a beginning, middle and end. You may notice the cigar’s flavor change as you smoke it. Tip #1: What suits you? 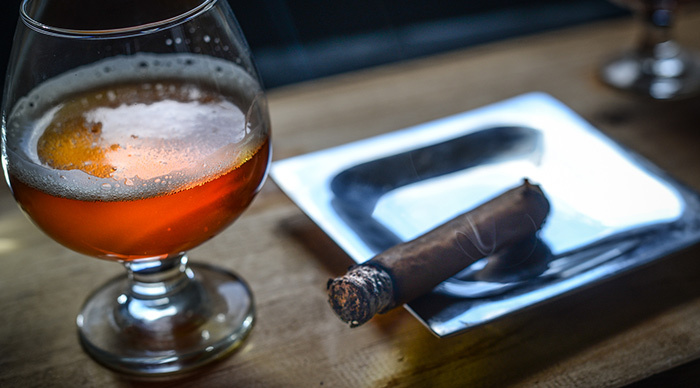 Some say there are rules one should follow when pairing beer with cigars. I disagree. 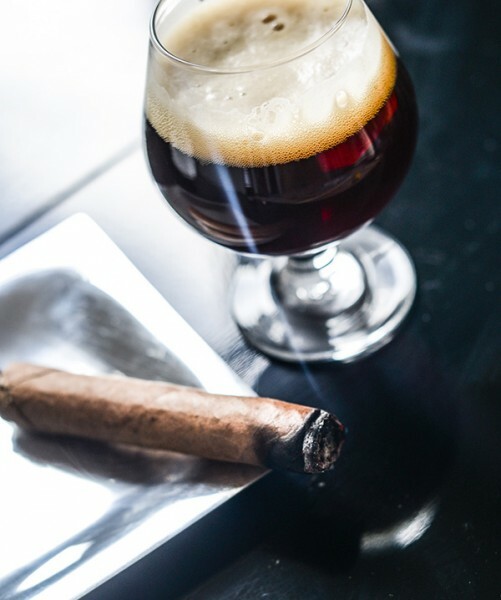 It’s true that a big, barrel-aged Belgian-style quadrupel will often pair well with a short robusto, while a maduro or oscuro wrapper around spicy Honduran tobacco will mate nicely with an IPA. Rules like this can be a good place to start, but I think you’ll do better to follow your own taste preferences. I usually like big, powerful, flavorful and boozy beers, but lately for cigar pairings I’ve been fond of beer that has a subtle yet crisp hop character with minimal bite. Especially in summer months, I tend to reach for a beer that is rich enough to taste over my favorite mild cigar, but delicate enough to compliment the flavor — something light and frothy on the tongue to refresh my palate from the smoke. Feel free to enjoy the practice of mating cigars in your humidor to beers in your fridge, no matter the repercussions. Sometimes you’ll be disappointed, other times delighted or surprised. It’s all part of the fun! Tip #2: What “type” do I choose? For your first few pairings, I suggest picking cigars that don’t tend toward any extreme. A nice, mild cigar can be as versatile as a wheat beer or mild IPA. Refrain from reaching for anything at the convenience store cash-wrap, paying more than $20 a stick, or clutching at the biggest, boldest cigar at the local humidor. For a mild smoke, there are popular, affordable and delicious offerings from Macanudo, 5 Vegas, Man O’War and Gurkha and Rocky Patel, many of which have claimed top ratings. You don’t have to pay a lot of money to get a lot of enjoyable flavor, either. My cigar pairing below starts with the Alec Bradley American Sun Grown, a cigar I truly enjoy which costs $4.95 a stick at my local shop. Just as with craft beer tasting and pairing, it’s important to take notes. Be sure to record the size, tobacco variety and wrapper of each cigar you try, along with how well you enjoyed it. That should help narrow down future selections. Tip # 3: What should I buy? What better way to try a variety of sizes, strengths and manufacturers without having to invest too much thought or money? Some samplers offer cigars, a humidor, a cutter and a lighter all in one at reasonable prices. You can often select the intensity of the cigars included, so for instance a “mild” sampler will net you some well-known and (you guessed it) mild cigars, perfect for the beginner. Alec Bradley American Sun Grown Blend cigars use Nicaraguan tobacco for both the filler and the sun-grown habano wrappers. The outer leaf imparts a rich spicy character over the smooth, balanced core flavor. The Sun Grown has a light- to medium-bodied smoke with a pleasing peppery flavor. For the beer pairing, I first chose a Wild Onion Brewery (Lake Barrington, IL) Pumpkin Ale after it won a coin toss against the other bottle in my fridge. Hoping to demonstrate that randomness isn’t always catastrophic, I cracked it open and lit up. The pumpkin was initially rather refreshing and citrusy, and finished with familiar fall flavors. The natural spiciness of the Nicaraguan tobacco paired well with the festive taste of the beer. Toward the end of the cigar, the smoke seemed to highlight the sweet, sugary and zesty qualities of the pumpkin ale. At the same time, the beer helped subdue the growing intensity of the cigar. Next, I opened an Irritated Koala Smoked Tea Black IPA from Two Brothers Brewing Co. (Warrenville, IL). I enjoyed the smoke’s dominance in this pairing — the beer faded quickly under the smoke, leaving only traces of hop character. It was refreshing and rounded off the spicy edge of the cigar. As someone who is constantly jumping from one thing to the next, it’s not often that I can sit with a cigar and find myself so content and reflective. With the proper beer to go along with my smoke, though, I tend to slow down and truly appreciate the experience. While my preferences may not be yours, the fun of pairing is in searching for the perfect combination. It’s not just about puffing smoke and drinking beer; it’s about how you feel when the blend of the two hits you just right.